Ernest Thomas Sinton Walton was born on 6 October 1903 in Dungarvan, Co Waterford, son of a Methodist minister. He was educated in Banbridge and Cookstown and in 1915 he entered Methodist College, Belfast, where he excelled in mathematics and science. In 1922 he went to Trinity College, where he read the honours courses in both mathematics and experimental science. 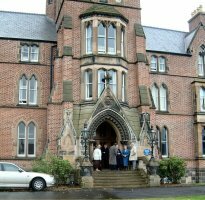 He graduated in 1926 with first class honours in both subjects and received his M.Sc. degree in 1927. In that year he went to Cambridge University to work in the Cavendish Laboratory under Lord Rutherford. Driven by the Rutherford’s call for ‘a million volts in a soapbox’, Walton and John Cockcroft built an accelerator which provided a far greater and more controllable particle flux than had previously been available. The accelerator was built in a disused room in the Cavendish Laboratory, and supplied with several hundred kilovolts from a voltage multiplier circuit designed and built by Cockroft and Walton. 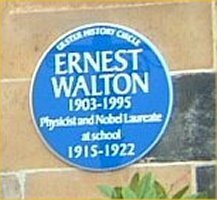 On 14 April 1932 Walton turned the proton beam on to a lithium target. 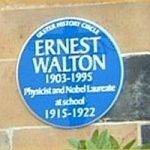 Despite all the odds against them, they succeeded in being the first to split the atom, and Walton was the first to see the reaction taking place. In 1934 he returned to Trinity College, Dublin where in 1947 he was appointed Erasmus Smith’s Professor of Natural and Experimental Philosophy. In 1960 he was elected Senior Fellow. Date Plaque Unveiled: 6 October 2003 (the 100th Anniversary of his birth). Click HERE for Photos of the Unveiling.